appearance in the HST deep fields. Over the years several schemes to identify galaxies at high redshift have been developed, but the most common technique is known as the "Lyman-break method.'' In every galaxy there are not only plenty of stars, but also a lot of hydrogen gas clouds. These clouds will absorb most of the bluest light emitted by young stars, which causes the blue portions of the galaxy's spectrum to be completely missing. We call the missing region of the spectrum the "Lyman break*.'' Due to the expansion of the Universe, distant galaxies are receding from us, resulting in a "redshifted'' spectrum. Like the Doppler shift of the siren from a passing ambulance, the expansion stretches the spectrum of a distant galaxy, causing the light to be observed at redder wavelengths. Therefore the Lyman break is observed at progressively redder wavelengths as the distance of a galaxy increases. So to find a distant galaxy, we take many images of a galaxy at varying wavelengths and identify the wavelength where the galaxy is missing or is said to "drop out.'' 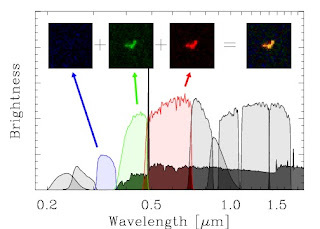 In the related figure, we show the spectrum of a typical distant galaxy (in dark grey) with a series of filters (in light grey, red, green, and blue), but just focus on the colored filters for the time being. Notice how the spectrum has completely "dropped out'' in the blue-shaded filter; although stars have emitted light at these wavelengths, this light has been absorbed by hydrogen gas. Above each filter you can see a typical distant galaxy in HST images (colored accordingly). It is important to notice the complete lack of observed light in the blue image, despite robust detections in the green and red images. This results in a characteristic three-color image, which is the hallmark of a high-redshift (or distant) galaxy. In that still image, we have showed how three adjacent red, green, and blue filters can be used to find galaxies at a specific redshift (in that example, it was redshift 3.0 or a distance of 11.5 billion light years). We can select other redshift windows by tuning our filters to sample the Lyman break at other redshifts. In the above video, we demonstrate how as redshift/distance increases the Lyman break moves to progressively redder wavelengths and show representative images of high-redshift galaxies from several HST deep fields. When it falls between two adjacent filters, we have a means to find distant galaxies. If you carefully watch the grey spectrum as it moves through the filter-set, you may notice a depression growing by the strong emission line (known as Lyman alpha). Stay tuned for more details on this depression, its causes, and its uses! CANDELS 2011 van der Wel et al. HUDF 2010 Illingworth et al. ERS 2010 Windhorst et al. HUDF 2004 Beckwith et al. HDF 1996 Williams et al. *For the quantum mechanically inclined, the Lyman break occurs at the Lyman limit of 0.0912 microns due to the energy spectrum of neutral hydrogen. How Do We Measure Galaxy Morphology? Did CANDELS find the first stars in the Universe?